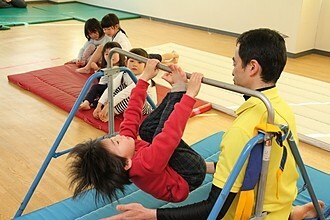 Mats, vaulting horse and horizontal bar in the Education Center in rope, ball, put on skills that are needed. Professional athlete balance ball, ladders, hurdles, also uses state-of-the-art training, improve basic physical strength, flexibility, agility and physical strength. First of all, "fun! "" Want to do again! "The pull of the spontaneity. Program disappears berth, moving the body could become like that. ★ I'll break even using another time until the end of the next month and day of the week you can.